Two of Aaron Hernandez's associates have been indicted on murder charges, a move that has major implications for Hernandez's case. Now, to convict him of murder, prosecutors will no longer have to prove that Hernandez pulled the trigger. This afternoon, a Bristol County grand jury returned indictments on Ernest Wallace and Carlos Ortiz, charging them in the killing of Odin Lloyd. Hernandez had previously been the only one charged with murder, while Wallace and Ortiz had been charged with accessory to murder after the fact. "A defendant knowingly participates in the commission of an offense if he [she] intentionally participates in some meaningful way in the commission of the offense, with the intent required to commit the offense. Such participation may take any of several forms. It may take the form of personally committing the acts that constitute the crime, or of aiding or assisting another in those acts. It may take the form of asking or encouraging another person to commit the crime, or helping to plan the commission of the crime. Alternatively, it may take the form of agreeing to stand by at, or near, the scene of the crime to act as a lookout, or to provide aid or assistance in committing the crime, or in escaping, if such help becomes necessary. The agreement to help if needed does not need to be made through a formal or explicit written or oral advance plan or agreement; it is enough consciously to act together before or during the crime with the intent of making the crime succeed. "Mere knowledge that a crime is to be committed is not sufficient to convict the defendant. The Commonwealth must also prove more than mere association with the perpetrator of the crime, either before or after its commission. It must also prove more than a failure to take appropriate steps to prevent the commission of the crime. "Mere presence at the scene of the crime is not enough to find a defendant guilty. Presence alone does not establish a defendant's knowing participation in the crime, even if a person knew about the intended crime in advance and took no steps to prevent it. To find a defendant guilty, there must be proof that the defendant intentionally participated in some fashion in committing that particular crime and had or shared the intent required to commit the crime." 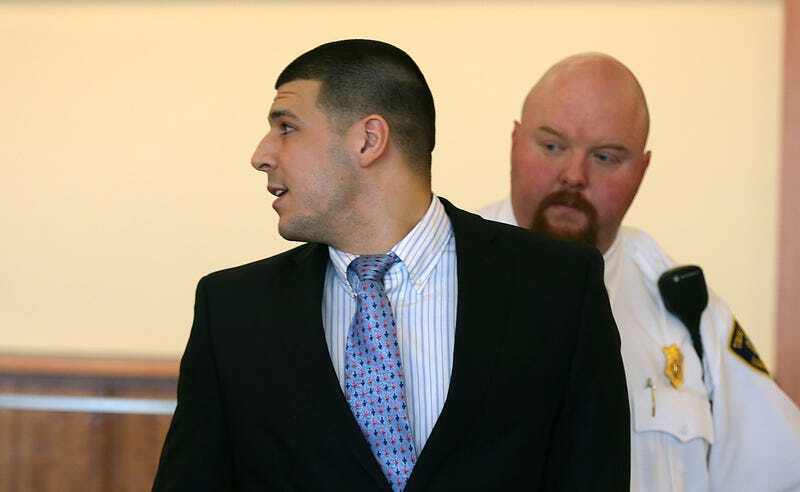 Prosecutors will now have to convince a jury that Aaron Hernandez intentionally played a material role in the killing of Odin Lloyd. That's a big step down from proving he fired the fatal shots, especially since the murder weapon is still missing.